Deputy Defense Minister insists deporting assailants and their families will create instant deterrence after rock attacks. The IDF could intervene in future rock-throwing attacks, Deputy Defense Minister MK Rabbi Eli Ben-Dahan stated Wednesday, in the event the Israel Police needs reinforcements. "If the police think it needs help then I have no doubt the army would be happy to lend a hand and help," Ben-Dahan stated to reporters as he left the funeral of rock attack victim Alexander Levlovitz, 64. "While we celebrated Rosh Hashanah, our Arab neighbors threw rocks and killed Jews," he continued. "A rock kills, a rock is a weapon, and I hope the punishment for throwing rocks becomes more severe." 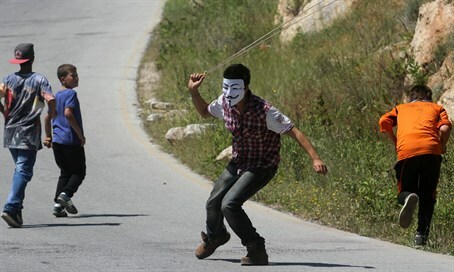 While the punishment for rock-throwing was already increased earlier this year, Ben-Dahan promoted much stronger measures against assailants. "I am of the opinion that rock-throwers should be deported, along with their families, from the country," he said. "This is the ultimate solution and I have no doubt that we would have to use it only once." "Once we deport one family member of a rock-thrower it will deter all others." The deputy minister himself lives very close to where the attack took place. "It was two minutes from my house," he reflected. However, like Jerusalem mayor Nir Barkat, he urged Jerusalemites not to succumb to fear tactics. "I'm not afraid," he said. "If we are afraid, we give terrorists a win." "We have to live our daily lives and make an effort to catch those who try to harm us, and bring them to justice," he added.